Kays Kids: I'm home with my dear Granny. I'm home with my dear Granny. You don't know how good it feels to be home. I could not stop hugging my Granny, and I whispered in her ear I loved her. It was much cooler than in America. so I had to wear my scarf, and boots again. I could not wait to go inside and jump on my bed and see all my own things. Australia really is a great place to live. Now don't get me wrong, America would be good too; if every one had their Granny living with them there. After cookies and honey milk, Granny brought this parcel out that was addressed to me. I opened it very quickly, and after unwrapping the beautiful lavender tissue paper out popped this most beautiful little bear. She was so glad to get out of that parcel and the tissue paper. She could not stop smiling at me. She told me she came all the way from Russia and the lady who made her was Svetlana Mikhailova. 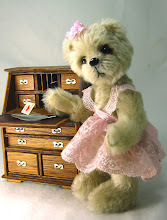 She is a very clever lady, because this little bear who is called "Te t'aime" which means I love you, did fantastic work. 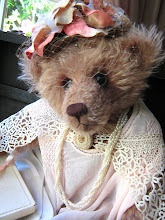 Svetlana made her out of Lavender Plush with silk ribbon embroidery on her head. She is very heavy, and both Granny and myself can't stop hugging her. In the parcel I found 2 children's books with lovely pictures in. One story we can tell is the story of Goldilocks, because we saw 3 bowls of porridge. The other book is getting translated by a friend. I looked at those pictures and funny Russian writing for ages. and guess what, something that is not there any more....???? A chocolate with a little bear on the label. The problem is I can't show you because I don't have the chocolate. It disappeared some where. I'm not sure where????!!!! You didn't see me lick my lips did you? "Te t'aimime" needed lots of cuddles to make her feel at home here in Australia. Granny and I are both blown away that Svetlana could be so generous, and give us this most wonderful unexpected present. Thank you very much Svetlana. I could not stop telling Granny all about what happened at camp, then I was plum tuckered out. So It was early to bed. I was not sure what T'aime would have eaten in Russia. We made lots of warm toast with honey and peanut paste on. With a big glass of warm chocolate milk, and she loved it. We made a comfy bed for her, and I told her I would show her lots about Austrlia in the morning. I can't wait to hit the pillow in my own bed. 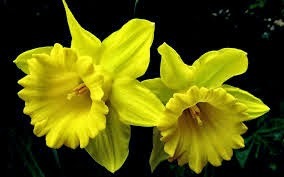 It's Daffodil day in Australia to day, so I have picked these for all my followers. My thought of the day. "The smallest good deed is better than the grandest intention." Phew, we're so glad that wee girl didn't suffocate while waiting for you to get home from camp! 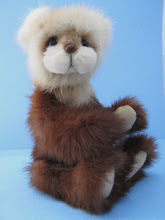 We hope Svetlana packed in lots of provisions for her enforced hibernation... Still, she looks nicely settled in now, so you two have fun together! Maybe Granyy ate that chocolate, and that is only fair since you have been away for so long. Coming home is always the best, isn't it? Happy Daffodil Day to all of you. Good to hear that you are home with Granny! Kay Hello dear, how are you? I read with affection the whole story. Welcome home Wilbur! It was nice to see and read about your adventures in camping, but my favorite pic is the one of you and Granny hugging. So sweet. You are a very lucky beary. Your new friend T'aime is very pretty. I am sure she will love to hear your stories and see your beautiful country. Ohhh Wilbur wat heerlijk om weer thuis te zijn bij je lieve Oma. Je kan heel goed zien dat jullie elkaar heel erg hebben gemist. Geweldig ook het PRACHTIGE cadeau dat jullie van Svetlana hebben gekregen. Zelf kijk ik ook vaak op haar site en ze maakt werkelijk fantastisch mooie beren. Wonderful that you are back home and reunited again. 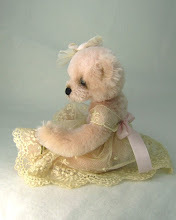 Te t'aime is a very sweet bear and a pretty colour - so lucky to be going to live at your house. Enjoyed seeing your lovely photos. da hat sich Granny ja sehr gefreut das du wieder bei ihr sein kannst. Und ihr beide habt euch über das süße Bärchen von svetlana gefreut. What a lovely gift from Russia with Love! And a fun story about Wilbur's home coming... very realistic! Enjoy a great new week. There is no place like home......especially when Granny is living there! Now, I'm sure you have a lot to tell to Granny so I won't keep you any longer! What a sweet story and a beautiful purple bear friend for Wilbur. I love your blog! How very sweet, these two are just adorable together! Welcome home Wilbur ... I think you're a real snuggly bear. My! your new Russian friend is so.... very sweet and I'm sure she's going to be a special little treasure for you and Granny. Oh Wilbur, you are the most lucky bear on the entire world now! And: you have the best Granny at all! Never forget this! Glad you are back home safe! Thank you, Kay, for this wonderful story! It was a great pleasure to read it. And your photos are so cute and full of tenderness!